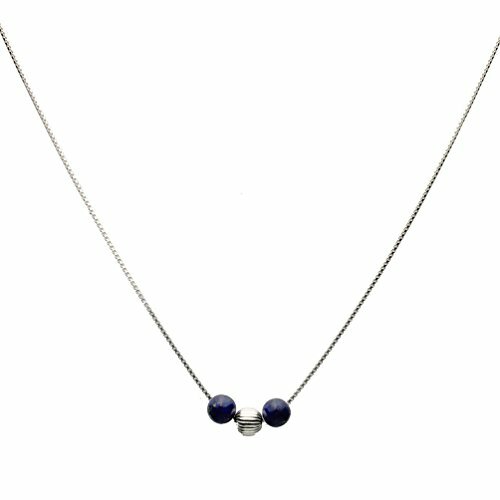 Smooth, polished 6mm sterling silver corrugated bead and 6mm blue lapis (dyed) stone beads are suspended on each of the shiny sterling silver box chain. A single sterling silver lobster clasp and sterling silver extender chain make this necklace easy to wear. The chain is the length shown plus a 2" sterling silver extender. Sterling silver pieces imported from Italy. The natural properties and composition of mined stones define the unique beauty of each piece. Stones may have been treated to improve stability, durability or appearance. Gift box or organza pouch included, color or style may vary.